Mike has been involved in the fitness industry collectively for 25yrs. Over this time he has learned how to bring clients a wealth of information and a wide variety of options that enable them to lead an active lifestyle. Mike is also a Licensed Zumba Fitness® Instructor offering Zumba Fitness® / Zumba Toning® and Zumba Kids/Kids JR® as well as the Beachbody INSANITY® workout. Please view web page for details. 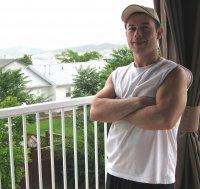 He has earned the BCRPA Certification as Personal Trainer, Weight Trainer and group fitness leader. He consults regularly with members of the community from a variety of fitness levels, ages and interests in order to implement solutions that create a sense of accomplishment and overall wellness. Prior to all this, he worked significantly in people-based opportunities; among them being Retail Management and Speaking for Sales training, Product Knowledge, and Financial Education workshops. He enjoys all the outdoor activities the west coast has to offer, with his wife and 2 children.